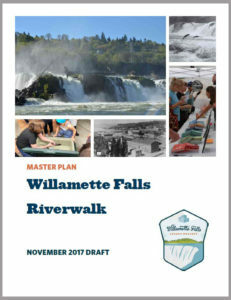 In early 2015, the Willamette Falls Legacy Project Partners (Oregon City, Clackamas County, Metro and the State of Oregon) initiated a public master planning process for the Willamette Falls riverwalk. The final master plan aims to provide a long-term vision that will guide future development and public use of the riverwalk. Throughout the planning process, there were multiple opportunities for the public to participate and provide feedback. We held five large-scale community events and an online community check-in, as well as dozens of tours, presentations and community conversations. The draft master plan was presented at a Metro Council work session on Nov. 21 and is available for public review and commenting until Dec. 13. Project staff will be presenting the draft master plan at an Oregon City City Commission work session on Dec. 12. We anticipate Metro Council adoption of the master plan in January 2018, with Oregon City adoption following soon after. Adoption of the master plan memorializes the master planning process and is an important next step to making a reality of the vision that thousands of Oregonians have helped to create. Willamette Falls is one of the nation’s most beautiful and historic natural wonders. The second largest waterfall by volume in North America, it has long been an important cultural and gathering place for Native American tribes. Industrial development, beginning in the 1830s, blocked the Falls from public access and greatly modified the riverbank with man-made industrial structures. The Blue Heron Paper Company was the most recent in a succession of various industries that nested itself on the east bank of the Willamette River at Willamette Falls. The closure of the paper mill in February of 2011, due to bankruptcy, allowed the opportunity to bring public access to the Falls for the first time in more than 150 years. Following the paper mill’s closure, the City of Oregon City, Clackamas County, Metro and the State of Oregon joined together as Project Partners to form the Willamette Falls Legacy Project. These four government agencies have partnered since 2012 to establish and carry out a vision for the 22-acre site and reduce and remove barriers to redevelopment. A key feature of the vision for the project site is the creation of a world-class riverwalk to allow for public access and viewing of Willamette Falls. In 2014, Falls Legacy LLC purchased the mill site and donated an easement along the shoreline to Metro for the purposes of building a public riverwalk. Metro has taken the lead in riverwalk design using funding from its 2006 Natural Areas Bond, along with contributions from the other three agency Partners and the private property owner. Guided by the project’s four core values of economic redevelopment, public access, historical and cultural interpretation and healthy habitat, the riverwalk design began in 2015. Robust community engagement has shaped the riverwalk conceptual design; thousands of people have participated in events, surveys, tours and meetings related to the Willamette Falls riverwalk. Based on community and site owner input as well as technical studies and conservation science, the recommended riverwalk plan takes inspiration from the power of the Falls, selectively carving away concrete, steel, wood and stone from the project site to reveal the rich cultural, ecological and geological layers of history aggregated on the site. The overall concept will be constructed in phases, with Phase 1 beginning once the Partners reach an agreement with the private property owner. Phase 1 will include habitat restoration, historic and cultural interpretative elements and open public access closer to the falls. Phase 1 will focus demolition and site preparation in the Yard and Mill Reserve areas and provide a viewing area in the Mill H building and Boiler Plant complex. The project has also spurred the creation of a 501(c)3 nonprofit friends group, Rediscover the Falls, that is dedicated to advancing the Willamette Falls Legacy Project through building friendships and fundraising. Keeping the four core values of economic redevelopment, public access, historical and cultural interpretation and healthy habitat as a guide, the riverwalk will be one of the many transformations of this site over time. Metro and the Project Partners are writing a new chapter--one that honors history, provides healthy habitat, fosters the economic development opportunities and connects people with downtown Oregon City and Willamette Falls.